Why Aren’t We Buying More Stuff? Ironically Real PCE does not actually measure consumer spending. This is because to make the metric consistent it has to include implicit spending. Things like the rent that you pay to yourself. Things like the medical bills that Medicare and Medicaid pay on your behalf….Those things, however, are not fungible using cash. It doesn’t matter what is happening to the relative price of potatoes [if] you can’t spend Medicare dollars on them. Thus the pool [of] goods purchased with cash moves separately from the pool of goods either purchased on your behalf by the government or consumed implicitly. Instead he suggests looking at retail sales, which haven’t yet returned to their 2008 peak. But why? The straightforward explanations for this are either that people are optimally choosing to consume more leisure and fewer goods and services — that is, we are in the midst of a Great Vacation. Or, that something is preventing people from purchasing as many goods and services as our society is capable of producing. Since the former strikes us as so counter-intuitive, we fall back on explanations for the latter…..At certain times, for reasons we don’t completely understand, people suddenly start buying fewer things than we are capable of producing. Hmmm. In one sense, the reason we’re buying fewer things is mysterious, but in another it’s not: it’s because we don’t have enough money. 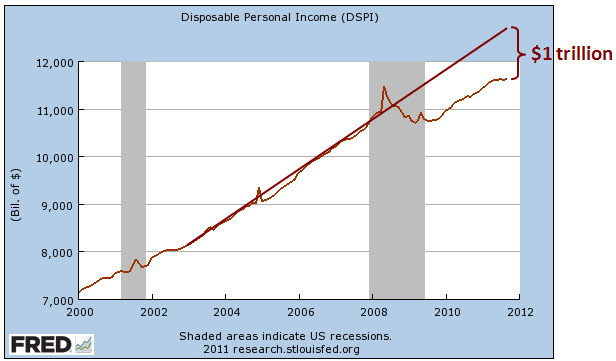 The NGDP targeting folks would probably tell us to look at nominal disposable income, and if you do that you see that we’re something like a trillion dollars under the trend growth rate of the last decade. The Fed could do something about that, but it’s chosen not to. So the nickel version looks like this: less money –> less demand –> less hiring –> more unemployment –> less money. Rinse and repeat.